The halogen bulbs sold with the chandeliers can melt parts of the fixture, posing fire and burn hazards. The Home Depot recalls involves Hampton Bay 3-Light Crystal Chandeliers and Home Decorators Collection 4-Light Crystal Chandeliers. The Hampton Bay 3-light chandelier has model number 03179-4 and the Home Decorators collection’s model number is 19161-4. The model numbers can be found on the top of the unit. 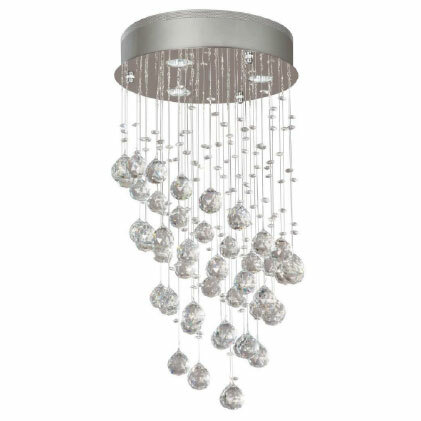 The chrome ceiling fixtures have dangling crystals, weigh about 16 pounds and have three or four 50-watt halogen bulbs. Consumers should immediately stop using the recalled chandeliers and contact Lumicentro Internacional S.A. for a free upgrade kit which includes 5 watt LED bulbs, suction cup, upgraded installation manual and new warning labels. The new labels identify that the fixture is only rated for LED bulbs with a maximum of 6.5 allowable wattage. There have been 39 reports of plastic on the unit burning and melting, wires burned, or overheating in the 4-Light Chandelier and one report of the unit catching fire. No injuries or property damage have been reported. Home Depot stores in Puerto Rico and U.S. Virgin Islands sold the Hampton Bay 3-Light Crystal chandeliers from September 2013 through February 2017. Home Depot stores nationwide sold the Home Decorators Collection 4-Light Crystal chandeliers from October 2015 through February 2017. Both sold for about $220. Home Depot Product Authority, LLC of Atlanta, Ga. Copyright (C) 2018 Hong Kong AQI Service Co., Limited. All Rights Reserved.